Rukka Imatra Gore-Tex Gloves: Hurray Finland! I bet you didn’t know that Imatra is a town in Finland (I didn’t either). Do you even know where Finland is? That I did know! But before you open up a new tab and click your way through Wikipedia, listen up. You need the best winter glove out there. I know you do. Gore-Tex X-Trafit, warm thermal-regulating goodness, all the protection you could ever dream of -- all of it! The new Rukka Imatra Gloves give you all of that, and more. For starters, Gore X-Trafit means you’ll have nice firm grip on your controls. Gone are the days of your winter gloves bunching up and preventing you from doing those sick wheelies on your way to work. Other people do that, right? No? Okay, just me, then. Well, on top of being completely waterproof, the Imatra gloves also have a fancy Outlast liner. What’s Outlast, you say? It’s a PCM, or phase change material. It actually regulates temperature. Your hands won’t be too hot, they won’t be too cold, they’ll be just right. The Imatra isn’t the warmest pair of gloves out there, but if your riding takes you from the mountains to the valleys to the coast, you want a glove as variable as your sense of adventure. And if crashing sounds like something you’d do (don’t lie, it is), the Imatra has some of the best protection on the market. A scaphoid palm slider in hard plastic, carbon knuckles, and pinky finger bridge will ensure you can count to 10 long into senescence. And for riders with eyes on the fritz, a convenient visor wiper on both index fingers is a welcomed addition. And even though you should never text and ride, the Imatra has touchscreen pads on the fingertips of both the index and thumb. Cheers to that! But really -- no texting, please. Well, there you have it: an adventurous glove to match your adventurous spirit and adventurous wallet. 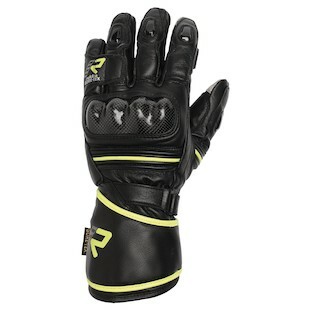 Not for the faint of heart, RevZilla brings you the Rukka Imatra Gloves!